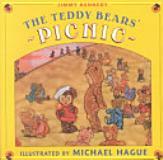 Happy Teddy Bear Picnic Day! The lyrics to this popular children’s song were written in 1932 by Jimmy Kennedy to music written in 1907 by John Walter Bratton. It was first recorded by Henry Hall and His Orchestra (1932). Below is a YouTube video of the original recording. According to Wikipedia, it has been recorded by multiple singers including Bing Crosby, The Nitty Gritty Dirt Band, Frank DeVol, Jackie Lynton, Rosemary Clooney, Dave Van Ronk, Jerry Garcia, John Inman, Trout Fishing in America, and Anne Murray. This little ditty has also been published in several picture book versions including the ones below. Pick up a copy today and enjoy the picnic!